Oatmeal is a dynamo when it comes to weight loss, offering several benefits to those who are trying to take off a few pounds. The University of Maryland Medical Center counts oats -- and other whole grains -- as part of a healthy weight-loss diet. Incorporate oatmeal into your diet daily, and your scale may show a difference. A serving of oatmeal has fewer calories than a couple of slices of bread and often has more fiber. One-half cup of dry oatmeal contains 150 calories. When prepared with a cup of water, it makes a voluminous meal. Prepare oatmeal with other low-calorie foods that you like. Berries, apples and peaches are all good choices. Stirring in a bit of almond, soy or non-fat milk gives oatmeal a richer, fuller flavor without all the calories and saturated fat found in a pat of butter or a drizzle of whole milk. 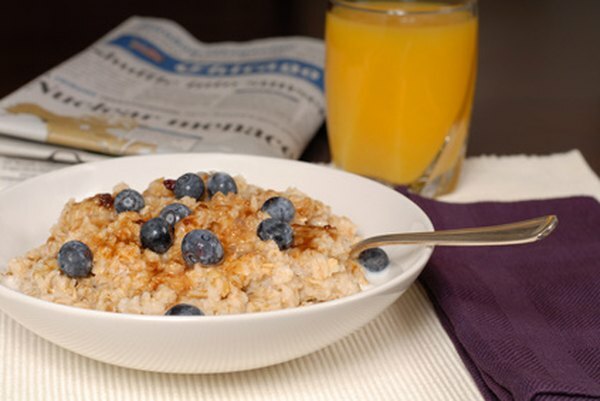 Eating low-fat foods can help you cut down on the calories you consume, and oatmeal certainly fits the bill. It has only 3 grams of fat per serving, and this fat is primarily polyunsaturated and monounsaturated -- the heart-healthy fats that your body needs to function. While many people boost the fat content of oatmeal by adding cream or butter, you can keep it healthy by using non-fat milk or a reduced-fat spread. Oatmeal is one of the most filling foods that you can eat for breakfast, according to Dr. Mary Ellen Camire, Ph.D., professor of food science and nutrition at the University of Maine. Not only does it beat out doughnuts and white bread in satiety rankings, but it also trumps eggs and high-bran cereal. Oatmeal is a snap to prepare in the microwave, taking only three or four minutes from start to finish. It provides an easy way to satisfy snack cravings without adding too many extra calories or fat to your diet. You can also use oatmeal as a meal replacement. Prepare a bowl of oatmeal, add a quarter-cup of fruit, a tablespoon of protein powder or nut butter and a dash of nonfat milk, and you’ve made a healthy meal without filling the sink with dishes. You can increase the fiber content by adding a tablespoon of freshly ground flax seeds, which are also an excellent source of heart-healthy omega-3 fatty acids. Eating breakfast is one of the secrets of weight loss and long-term weight control. Preparing oatmeal in the morning helps you develop the habit of eating breakfast, if you don't already. You're more likely to lose weight and maintain the loss if you continue your new habit of starting the day with a healthy meal.